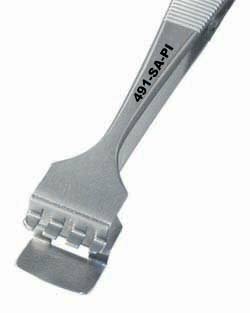 The 491-SA-PI two star wafer tweezers for 4" wafers has 4 fingered upper Paddle which limits surface contact. The overall Length is 5". the tool is made of anti-magnetic stainless steel and features serrated handles for better control. If you have any questions about this product by Excelta, contact us by completing and submitting the form below. If you are looking for a specif part number, please include it with your message.